Flags were lowered to half mast and people across South Africa commemorated Nelson Mandela with song, tears and prayers on Friday. Meanwhile as the South African government prepared funeral ceremonies that will draw leaders and other dignitaries from around the globe. A black SUV-type vehicle containing Nelson Mandela’s coffin, draped in South Africa’s flag, pulled away from his home after midnight, escorted by military motorcycle outriders, to take the body to a military morgue in Pretoria, the capital. Many South Africans heard the news of his death, which was announced just before midnight, upon waking Friday, and they flocked to his home in Johannesburg’s leafy Houghton neighborhood. In a church service in Cape Town, retired archbishop Desmond Tutu said Nelson Mandela, who became South Africa’s first black president, would want South Africans themselves to be his “memorial” by adhering to the values of unity and democracy that he embodied. “All of us here in many ways amazed the world, a world that was expecting us to be devastated by a racial conflagration,” Desmond Tutu said, recalling how Nelson Mandela helped unite South Africa as it dismantled apartheid, the cruel system of white rule, and prepared for all-race elections in 1994. 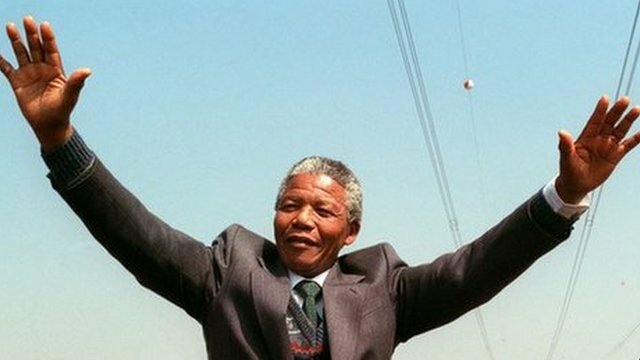 Nelson Mandela, also known by his clan name Madiba, was a “very human person” with a sense of humor who took interest in people around him, said Frederik Willem de Klerk, South Africa’s last apartheid-era president. The two men negotiated the end of apartheid, finding common cause in often tense circumstances, and shared the Nobel Peace Prize in 1993.